Bicycle Helmet Giveaway | Nashville Bike Accident Lawyers The Law Offices of John Day, P.C. Contact Tennessee Bike Injury Attorney The Law Offices of John Day, P.C. Bicycling is a great way to get outdoors and be physically active. It’s also a fun and healthy, low-impact exercise that can be enjoyed by people of all ages, but like any sporting activity, it does have certain risks especially if you are not wearing the right protective gear. Every year, 300,000 children need emergency medical treatment at a hospital for bike injuries and 26,000 of those injuries involve traumatic brain injuries. Indeed, bicycling accidents lead to more head injuries for children than any other sport, but less than half, only 48%, of children wear a helmet when biking. That is why The Law Offices of John Day, P.C. wants to ensure the children in our community have access to a free, safe and well-fitted helmet. Of course, it is not enough to have a helmet; kids have to wear it. And that is where Ryan Johansen of the Nashville Predators comes in. 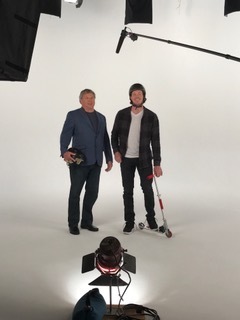 We hope that hearing Ryan Johansen talk about the importance of helmets will inspire kids to wear a helmet each and every time they get on a bicycle or scooter. Let’s face it: Ryan Johansen lends a certain coolness factor that lawyers simply can’t match. A helmet can reduce the risk of brain injury by as much as 85% because the helmet absorbs the majority of shock during impact rather than your skull or brain, and according to the Insurance Institute for Highway Safety, 60% of all bicyclists who are killed were not wearing a helmet. And while a helmet is not going to save your life from all bicycling accidents, it does increase your survival rate. In fact, in a study published earlier this year, scientists and pathologists examined 119 bicycling accidents in which the cyclist died and found 37% of the cyclists who were killed would have survived had they been wearing helmets. Hopefully by now, you are convinced of the need for a bicycle helmet. We certainly are which is why, in 2018 alone, our firm gave out more than 700 free bicycle helmets to children at events in and around the Nashville community such as Pioneer Days at Cannonsburgh Village; at our office in Murfreesboro; the Manchester Recreation Complex’s bike program—Mud Sweat and Gears; the Baby and Kids Expo at St. Thomas Rutherford; and the Back to School Fair at Cool Springs Galleria. Our next helmet giveaway will be at 12th Annual Fall Kids Fest at The Avenue Murfreesboro on Saturday, October 20, 2018 from 10:00 a.m. to 2 p.m. For more information on this event, click here. If you can’t make it to this helmet giveaway, check our web site often to learn more about our upcoming helmet giveaways!